LED-stickies, LED-throwies and sticky lights are all names for something that basically is a LED with an battery strapped to it and something to make it stick. 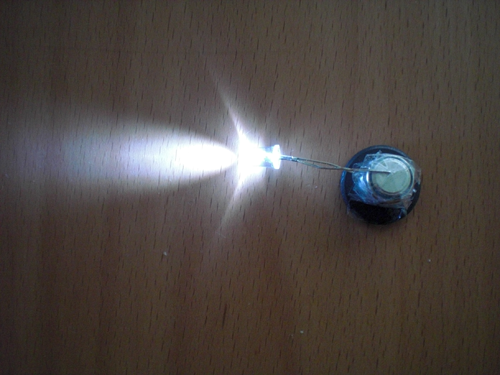 You can make your own light sticky by either using double-sided tape or a small magnet. The first one may be a little bit difficult to actually get sticking on things if you are not a very good thrower, or the quality of the tape is bad. The magnetic LED sticky will stick better, however there are two downsides: it can only stick on other objects that are magnetic and if you use rare-earth magnets then you need to be careful because these can break easily. Despite the cons, the most popular sticky is the one with a magnet. 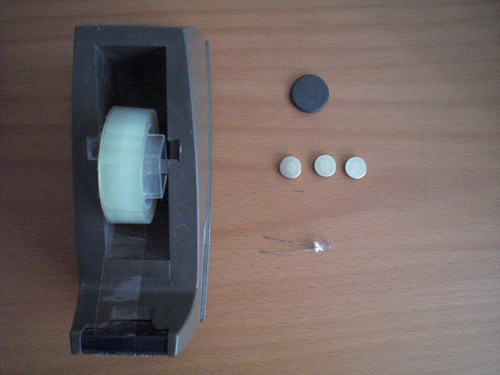 Use the tape to strap the button cell batteries to the LED and use another piece of tape to secure the parts onto the magnet. You can make cool effects by choosing different coloured LEDs and/or using two lights instead of just one. If you make a lot of these you can use your LED-stickies to create LED-graffiti or whatever else fun things you can think of! Please remember to clean up after you have had your fun, because the batteries contain toxics that shouldn’t be disposed into nature.